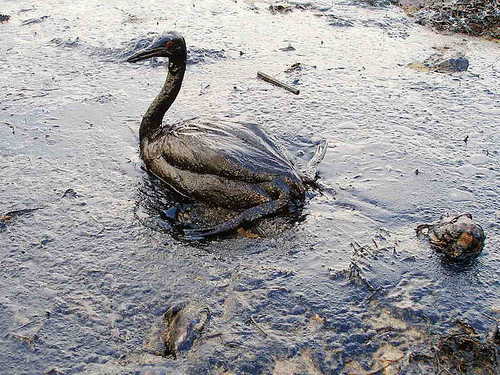 The Oil Spill: BP and President Obama at war 111 years ago | Phil-zine! Our commander-in-chief, President Obama's fault? The shifting sands of people’s opinions have inspired me to take part of my day and type this up. Yesterday it was BP’s fault, today it’s President Obama’s/our government’s fault, tomorrow it will be the pelicans’ faults! I’m not one to make big grandiose statements on current events, because the chances that history will prove me wrong, are to say the least, adequate. On the evening of the 26th of August, Kutozov and the whole Russian army were convinced that the battle of Borodino was a victory. Kutozov reported so to the Emperor. He gave orders to prepare for a fresh conflict to finish the enemy, and did this not to deceive anyone, but because he knew that the enemy was beaten, as everyone who had taken part in battle knew it. But all that evening and next day reports came in one after another of unheard of losses, of the loss of half the army, and a fresh battle proved physically impossible. It was impossible to give battle before information had been collected, the wounded gathered in, the supplies of ammunition replenished, the slain reckoned up, new officers appointed to replace those who had been killed, and before the men had had food and sleep. And meanwhile, the very next morning after the battle, the French army advanced of itself upon the Russians, carried forward by the force of its own movement now seemingly increased in inverse proportion to the square of the distance from its aim. Kutozov’s wish was to attack next day, and the whole army desired to do so. But to make an attack the wish to do so is not sufficient, there must also be the possibility of doing it, and that possibility did not exist. It was impossible not to retreat a day’s march, and then in the same way it was impossible not to retreat another and a third day’s march, and at last, on the 1st of September when the army drew near Moscow – despite the strength of the feeling that had arisen in all ranks, the force of circumstances compelled it to retire beyond Moscow. And the troops retired one more, last, day’s march, and abandoned Moscow to the enemy. For people accustomed to think that plans of campaign and battles are made by generals – as any one of us over a map in his study may imagine how he would have imagined how he would have arranged things in this or that battle – the questions present themselves: Why did Kutozov during the retreat not do this or that? Why did he not take up a position before reaching Fili? Why did he not retire at once by the Kaluga road, abandoning Moscow? and so on. People accustomed to think in that way forget, or do not know, the inevitable conditions which always limit the activities of commander-in-chief. The activity of a commander-in-chief does not at all resemble the activity we imagine to ourselves when we sit at ease in our studies examining some campaign on the map, with a certain number of troops on this and that side in a certain known locality, and begin our plans from some given moment. A commander-in-chief is never dealing with the beginning of an event – the position from which we contemplate it. The commander-in-chief is always in the midst of a series of shifting events and so he can never at any moment consider the whole import of an event that is occurring. Moment by moment the event is imperceptibly shaping itself, and at every moment of this continuous, uninterrupted shaping of events the commander-in0chief is in the midst of a most complex play of intrigues, worries, contingencies, authorities, projects, counsels, threats, and deceptions, and is continually obliged to reply to innumerable questions addressed to him, which constantly conflict with one another. Learned military authorities quite seriously tell us that Kutozov should have moved his army to the Kaluga road long before reaching Fili, and that somebody actually submitted such a proposal to him. But a commander-in-chief, especially at a difficult moment, has always before him not one proposal but dozens simultaneously. And all these proposals, based on strategies and tactics, contradict each other. A commander-in0chief’s business, it would seem, is simply to choose one of these projects. But even that he cannot do. Events and time do not wait. For instance, on the 28th it is suggested to him to cross to the Kaluga road, but just then an adjutant gallops up from Miloradovich asking whether he is to engage the French or retire. An order must be given him at once, that instant. And the order to retreat carries us past the turn to the Kaluga road. And after the adjutant comes the commissary-general asking where the stores are to be taken, and the chief of the hospitals asks where the wounded are to go, and a courier from Petersburg brings a letter from the sovereign which does not admit of the possibility of abandoning Moscow, and the commander-in0chief’s rival, the man who is undermining him (and there are always not merely one but several such), presents a new project diametrically opposed to that of turning to the Kaluga road, and the commander-in-chief himself needs sleep and refreshment to maintain his energy, and a respectable general who has been overlooked in the distribution of rewards comes to complain, and the inhabitants of the district pray to be defended, and an officer sent to inspect the locality comes in and gives a report quite contrary to what was said by the officer previously sent, and a spy, a prisoner, and a general who has been on reconnaissance, all describe the position of the enemy’s army differently. People accustomed to misunderstand or to forget these inevitable conditions of a commander-in-chief’s actions describe to us, for instance, the position at the army at Fili and assume that the commander-in-chief could, on the 1st of September, quite freely decide whether to abandon Moscow or defend it; whereas, with the Russian army less than four miles from Moscow, no such question existed. When had that question been settled? At Drissa, and at Smolensk, and most palpably of all on the 24th of August at Shevardino and on the 26th at Borodino, and each day and hour and minute of the retreat from Borodino to Fili. …Kutozov’s expression grew more and more preoccupied and gloomy. From all this talk he only saw one thing: that to defend Moscow was a physical impossibility in the full meaning of those words, that is to say, so utterly that if any senseless commander were to give orders to fight, confusion would result but the battle would still not take place. It would not take place because the commanders not merely all recognized the position to be impossible, but in their conversations were only discussing what would happen after its inevitable abandonment. How could the commanders lead their troops to a field of battle they considered it impossible to hold? The lower grade officers and even the soldiers (who also reason) also considered the position impossible, and therefore could not go to fight fully convinced as they were of defeat. If Bennigsen insisted on the position was no longer important in itself but only as a pretext for disputes and intrigue. This Kutozov knew well…. …But something had to be decided, and these conversations around him which were assuming too free character must be stopped. They retreated and Napoleon did soon after as well. Now take that and add the clatter of news reporters bringing with them their already solvent opinions before a single word of a speech is given, then wanting to know “the truth”, when the truth changes every few minutes as more oil pours out from the earth. Or the politicians who simply want some camera time in hopes that their words are the correct ones so they can quote themselves in the next campaign. Or the endless ignorant, uninformed comments made by the general public on blogs and news articles across the internet. If you’ve taken the time to read this and you don’t know why Tolstoy’s words from over 100 years ago about a war between Russia and France has anything to do with the oil spill, you have no right to judge anyone involved in this epic dilemma, especially President Obama. Think before you speak, even if it brings you back to the same conclusion, you’ll sound much more convincing and informed. Best of luck to you President Obama in dealing with more than just the oil spill, but all of the ignorance that follows in its wake. I would have said the same for Bush, Clinton and any other commander-in-chief that fell under the axe of our society. It’s amazing to consider how much more intelligent people’s remarks, conversations and newscasts might be if you could imagine that any one of them had read anything other than popular fiction or considered something other than their own point of view. This entry was posted on July 14, 2010 at 9:43 pm and is filed under Current Events. You can follow any responses to this entry through the RSS 2.0 feed. You can leave a response, or trackback from your own site.